I have had several answers to my inquiries about Mr. Llona3, all reassuring, like the enclosed4. I would like to have him make the translation, and I would be very willing to wait for my share of the fee you ask him for the right to publish the book5 in French. I believe I am entitled to half of this fee. Would you, therefore, be willing to write him that you will let him undertake the translation and publication for fifty dollars on signing of the contract, and the rest after he has sold a few thousand copies? It is very hard to make a French publisher risk anything just now. The man's notes on the first chapter were so good that I would like to have him make the translation. While such a translation would not mean anything to my American publishers, it would please me very much, and would put you to no trouble except that of relaxing your terms a trifle. This, I should think, you would be willing to do, if I am willing to forego my share of the fee. Will you ask Mr. Linscott6 to send me the original photograph from which this cut was made7? I have lost the only other one I had, and I have meant to ask you for this for a long time. Please also send me one of the cuts made from it, as I want to send it to Mr. Llona to use in France8. He selected it as the most peau rouge9 in my collection. I think he will present the book well. He has worked out some interesting renderings of idiomatic expressions. 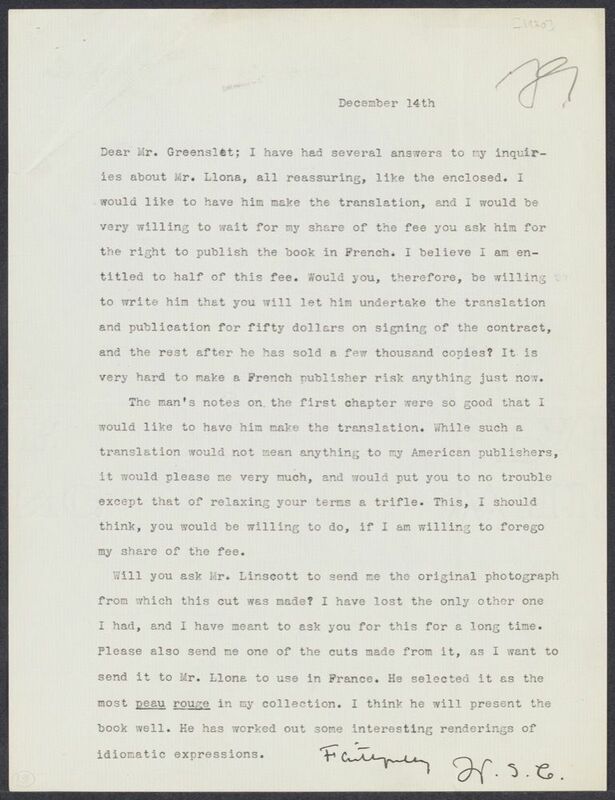 In Greenslet's response of 15 December 1920, he quotes Fanny Butcher (Victor Llona is "a young man of intelligence and some fortune"), apparently from the letter Cather enclosed. Based on Llona's personal wealth, Greenslet suggested 500 francs or thirty dollars as an initial payment to Llona. Translation: red skin (French) (i.e. Native American). Linscott, Robert N. (1886-1964). 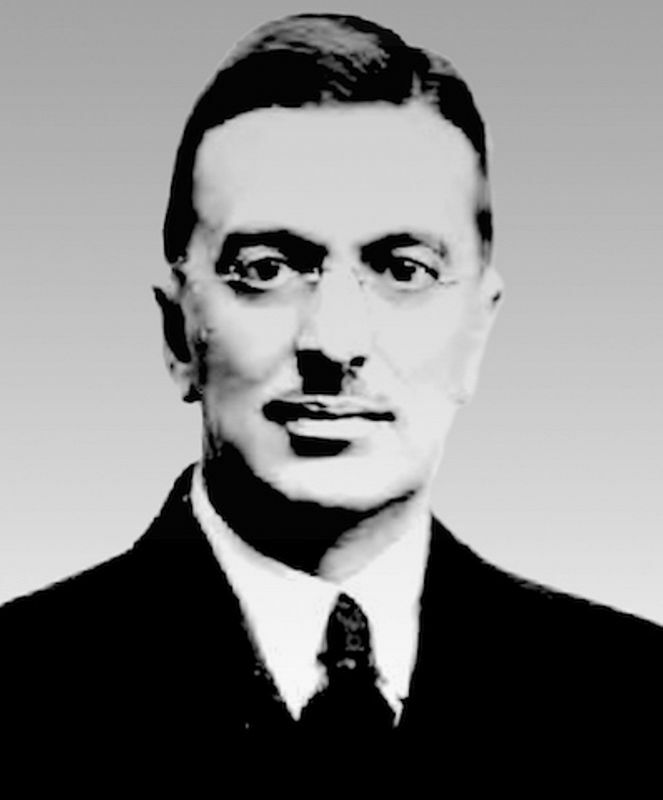 American editor. Linscott began as an office boy at Houghton Mifflin in 1904 at age seventeen. He became the company’s advertising manager, handling publicity for some of Cather’s books, and later moved to the editorial side, handling works by Carson McCullers, Truman Capote, and others. He moved to Random House in 1944, where he edited several anthologies, including a best-selling edition of Emily Dickinson’s letters and poetry.